July 2-8, 2011 - Belize it or not...Bear & Em in Belize! Today was a busy and tiring day. We spent the morning taking care of some financial business on the condo, and also checked on progress on the unit. A few small items had been taken care of, including hooking up the washer and dryer, but we didn't end up moving today, and I expect it will still be several days more. Curtains aren't up, and being on the first floor, this is important for privacy as there are workers milling around constantly. The dishwasher is still sitting in the middle of the kitchen as the water line is not yet completed, and the final cleanup has not occurred. There are some other small things on the punch list remaining, but those are the most important things to us to make the condo liveable. In the meantime, we have most of the comforts of home here in the Grand Caribe unit we're staying in, so we'll stay put until the time is right. We'd rather it be right than rushed. It was a gorgeous day today, our first fully sunny day with no rain and lots of great wind. The wind was so good that we opened up last night and have not had to use the A/C since! There is nothing like sleeping with the windows wide open, breezes blowing in, and the sound of waves out the window. Here the waves are fairly far away, from the reef, but when the wind is good, you do hear them. There were quite a few sailboats out there today, as it was perfect sailing weather. I even managed to get into the pool for a short dip, and it felt great. We had hoped to get out in the Grand Caribe kayaks this afternoon, but some other guests had already taken them out. At some point, Barry could see from our veranda the kayaks floating way down south, without any paddlers aboard. With his binoculars, he saw the hapless paddlers way out at the reef, attempting to swim back to shore (it's a loooong way). We knew then we weren't going to be paddling today as we still wanted to take a bike ride, so we stopped in to tell the office about the situation on our way. They started scrambling, but as we were heading out on our ride, we saw that a boat had picked up the paddlers and was towing the kayaks back to the Grand Caribe dock. Guess some lessons were learned today! It could have ended badly, as Barry could see with his binoculars that the life jackets were in the kayaks rather than on the swimmers. We'd learned from our kayaking days that you never leave your boat without anchoring it or tying it up to something, and were surprised that these folks didn't seem to know that. Fortunately, their misadventure had a happy ending. We headed out on our bike ride up north, and it was a tough one today due to the high winds right in our face heading north. Also, since it hadn't rained, the sand was looser and fluffier, making for many places where we couldn't ride but had to walk for short distances, which is tiring. We finally reached a point where construction was being done and there was a huge lake of water right in our path (not sure what in the world they were doing, but it didn't seem quite right! ), so we turned around. Much easier going with the wind at our backs! We were still dealing with the soft sand, though, so we decided to take the road off the beach and go back that way. Much to our surprise, we happened upon the new road to a development called Grand Belizean Estates. They haven't built any homes yet, but the road is a great one to ride on as it is relatively smooth (by Belizean standards), has fewer puddles, and is a goodly amount of mileage. So we did the entire loop. It was much harder coming back as we had the wind at our backs on the way out, then a stiff headwind heading back to the main road. We were exhausted but happy to find the road. All this biking is making me thirsty! We rode back to Grand Caribe via the "main" road (still unpaved north of town), not the beach, and it was pretty tough going as there were huge puddles left from previous rains and some very bumpy, rocky sections. We were exhausted after about 2 hours and 45 minutes of riding. But, dinner remained to be cooked, so we jumped right in without even taking the time for showers. I made pasta with organic veggies from Healthy Belize, and Barry made salad, rum drinks, and heated bread from the bakery. It was quite a feast, and we enjoyed eating it out on the veranda since the wind kept the skeeters away. To top off the meal, we split a delicious piece of Key Lime pie from the beach restaurant here at the Grand Caribe, which we brought back to the condo to eat. Yum! We found this beautiful conch shell on our ride today! Today we woke up to dark skies and rain on the way, which foiled our idea of getting a very early start to town on our bikes. Instead we had to wait out the rain for awhile, and then we chose to walk to town as we knew the roads would be very muddy after the heavy downpour. Unfortunately conditions after the rainfall were very conducive to mosquito activity, and we were slapping and dodging the little bloodsuckers most of the way to town. We both got a few bites along the way. Once we made it to town, we didn't have any problems with them. We went by to see the guard at The Phoenix, Raphael, again so Barry could practice his Spanish a little. Another employee there, Daniel, helped a bit with translation, since he speaks better English than Raphael. We learned that Raphael is from El Salvador, while Daniel is from Corozal, Belize. We went to various places around town. We visited the public library and found that despite being small, it had a more than adequate collection of adult fiction, including some of our favorite mystery authors, so we should have no problems finding enough books to read down here. We happened upon a large (by Belizean standards, since they don't have big box stores) housewares/general variety store, Caye Supplies, and checked out their wares. They had quite a few things for the kitchen and home, but prices are certainly higher than in the US! Next, we went to two grocery stores for our daily grocery needs. Finally, we bought some more delicious breads from The Baker, one of our very favorite shops. After lunch we waited through another short rainstorm to head over to the condo. 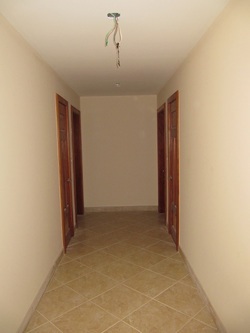 They'd completed a few more small finishing touches like doorstops, knobs on closet doors, and hallway ceiling lights. We're still not sure exactly when we'll be moving over there, but we're not in a huge hurry any more since there is a lot of noise and hustle/bustle in Chico with all the units in the building still under construction (ours is the furthest along), and there are many workers there starting around 7 am daily. There is also no internet/phone or cable TV yet; and no cookware in our unit, so it's nicer in this unit for cooking. That said, of course we'd love to be in our own place, and living there for a week or so will help us see what additional items we need to buy or ship from the US that we may not have thought of before. Looks a little different from the library back home! Next, we headed out on another bike ride north. Barry had determined from the radar we looked at online right before leaving that it would not rain on us. However, his forecasting skills will need some tweaking for Belize weather, as we were suddenly caught in a downpour on our way north. We quickly ducked into a beach bar at Rendezvous Restaurant, and that proved to be a fortuitous stop, as the bartender, "Shaggy" was a friendly and fascinating guy. What a small world -- his mother and many of his relatives live in Waukegan, Illinois, where Barry's mother is from! He told us that there is quite a Belizean community in Waukegan. Who knew?! He mixed a mean rum and pineapple juice, which fortified us for the rest of our ride once the rain let up. We made it up to the Blue Reef resort, a fairly long way north, before turning around. On our way back, we stopped on the beach when a dog came up and was barking at us loudly and persistently. A tourist kept telling the dog, who belonged to the caretaker of the home they were staying in, to be quiet. We ended up talking with the tourist (Marty), for some time. He and his wife Sarah are from Texas and were visiting Belize for the second time. Sarah eventually came out to the beach, and we all had a nice chat. Finally, we finished our bike ride. By this time it was getting to be dinner time. Our chance encounters and conversations had lengthened the ride by about an hour over what we'd planned. 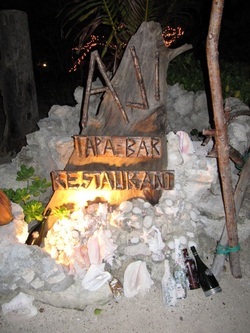 So instead of cooking, as we'd planned to do, we decided to save our pasta fixings for tomorrow night and head to the Palapa Bar & Grill right down the beach tonight. We walked along the beach to the bar, which is about 1/2 mile away. We met a couple of men who work there; Jack and Ricardo, and ate some yummy lobster tacos and burritos. After walking back to Grand Caribe (with my headlamp, which was great on the now-dark beach), we split a yummy oversize brownie we'd purchased at The Baker today. We topped off the evening by enjoying the stiff breeze from the lounge chairs on the Grand Caribe beach. The wind has been lighter this visit, so it was great to finally have a good, strong breeze. I was just on the edge of being too cool, even though it is in the low 80s! Ha! I'll be wearing sweaters and jeans here in the winter, for sure. It's been a busy afternoon and evening since the earlier blog entry. We finally managed to be at the condo when Rupert was there, and we went over the punch list with him. Looks like everything will be done shortly. A few things may remain after this trip, but most are well in hand. The backsplash was further along, so we were able to snap a photo. It looks great! This was an interesting boat we saw from the veranda of the unit we're staying in in Grand Caribe. Looks like it was carrying palm fronds. You see all kinds of different things here in Belize! We also took some photos of some of the local wildlife as we walked over to Chico Caribe. Love these lizards and iguanas! After meeting with Rupert, we gave Bernie a call as we had a list of questions we had and wanted to get together with him, and bring the dragon fruit to Doris. He said to come on up, so we went up to his condo here in Grand Caribe and started picking his brain with questions about utilities, insurance, shipping, and many others. He is a huge wealth of information, and I took copious notes. He suggested a few additional things we might want to ship down, such as a de-humidifier, so we have more research to do now! Doris had been in town picking Lucky up from being groomed, but arrived while we were chatting with Bernie, so I gave her the dragon fruit. Hope she enjoys it as much as we have. Even though we have all the ingredients for a pasta dinner, we decided to eat at the Grand Caribe pool bar tonight for a change from Italian, since we've eaten pizza two nights in a row. We had a good dinner of chicken fajitas; unfortunately, the mosquitos were pretty bad tonight, and we were slapping and scratching through the meal. We agreed that we've had more bites this trip than we got in our trips last year combined. After I left off yesterday in mid-afternoon, we stopped in at the Grand Caribe office in hopes of seeing Jorge to give him the punch list for our condo, but we missed him. We did receive our first piece of mail here; however. I was a bit worried to see that it was a bill for part of our appliance package, which we'd paid for back in January and February. Fortunately, it's all been straightened up now, and we're paid up, as we knew we were. Whew! When we arrived back in front of Chico Caribe, we ran into Doris walking their dog Lucky, and we had a nice chat. She shared a lot of local knowledge, and we shared information about Healthy Belize with her, since she hadn't heard about it. For dinner we heated up the leftover pizza from the night before and also made a nice salad with the greens and veggies from Healthy Belize and the balsamic vinaigrette I'd whipped up. Since we'd also had some chips and salsa before dinner, we were completely stuffed after eating all that. Today we had a busy morning. We were up early, and Barry snapped this sunrise photo. The sun rises here at something like 5:15 am! We rode into San Pedro early so we could head south of town and do some extra miles. We made a quick stop at The Phoenix (where we stayed for our 25th anniversary last year), where Barry tried some of his rudimentary Spanish out on Rafael, one of the security guards there who speaks very little English. He seemed delighted! He remembered us from our visits last year, and was happy to see us a few days ago as we walked by, but Barry didn't think of trying some Spanish on him then. Unfortunately, while we were riding south of town it started raining, and we got quite muddy. Here are some photos of our ride. Check out those mud puddles! They already existed from previous rains, but today's just added to them. Turns out that it didn't even rain in town, so we didn't pick the best morning to ride south! On the way back into town, we rode down Zac's street, but he was all closed up, so we stopped at Marie's produce stand on the way back into town and picked out some nice-looking fruit. A pineapple, four bananas, a dragonfruit, and a mango ran us $13BZD ($6.50 US) -- not bad at all. Unfortunately, the man working there didn't have enough change for our $20US, so we asked him to hold our bag, and we'd go buy some things at a grocery store and get some change. So we pedaled several blocks back down south to Superbuy South and bought some items, then back up to Marie's to pay for our fruit. By the time we finished all that, we tried Zac again, and he was open. I ran back in for two more dragon fruit. We are going to take one to Doris as she has never had one. 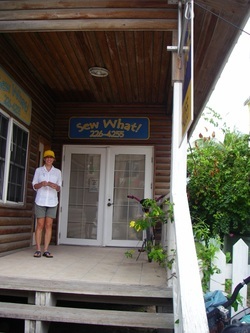 Next stop was Sew What to order roller shades for our condo windows. I'd been corresponding with the owner, Kate, via email, and it was great to finally meet her. I picked out some fabrics with her help, and they should be done before we leave this time. When we got back to the condo we're staying in, it was time to start getting lunch ready. We cooked the organic sweet corn we got from Zac yesterday, made some cheese toast, and scooped out half of a dragon fruit, to which we added some of Barry's "mash" of banana, mango puree, fresh lime juice, a small amount of orange juice, and a splash of coconut rum. What a lovely feast it was! We woke up to another cloudy and coolish day here, but we don't really mind; there will be plenty of hot, sunny days at some point, and there certainly have been enough of those in NC already. After breakfast we went over to the condo and saw that the range had been installed since yesterday, and someone was cleaning in the kitchen. Temporary electricity had been brought to the unit as well since we noticed a couple of lights were on. We were hoping to meet with either Rupert or Jorge to go over the punch list, but neither were around so hopefully we will catch them soon. Next, we hopped on the bike and headed south into town. We stopped for a quick chat with the bridge crew. Barry has had some friendly chats with them, and today we met the daughter of the bridge tender, a cute little girl named Pauline. It's fun to meet friendly locals, and they really do seem to appreciate it if you remember their names and show some interest in them. We rode down to south San Pedro for some more organic produce from Zac. He got a huge shipment (via Tropic Air) last night of produce picked on the mainland yesterday. Our haul today included salad greens, red peppers, three ears of sweet corn, five limes, and a dragonfruit (pitaya). We've never tried one before but keep reading about them. Can't wait to try it! Our next stop was at a large grocery store, where I bought some salad dressing fixings -- olive oil, balsamic vinegar, and Dijon mustard. I'll make a nice salad tonight to accompany our leftover pizza. After leaving the grocery, we got separated at a busy intersection when Barry went ahead of me. Hard to imagine that San Pedro can get that busy, but the roads immediately around the airport are packed with golf carts, a few taxis, and plenty of bicycles. I finally got through the turn, but by then he'd gone too far for me to see where he'd headed. He'd actually missed the next turn as we were in a part of town we haven't been to often. We'd talked about going to a second grocery store for milk (as the first one had no prices posted on milk, a pet peeve of mine), so I headed there, figuring maybe he was just a bit ahead of me. I waited for at least five minutes, but finally hopped back on the bike and headed back towards where we'd gotten separated and rode around looking for him. I had no luck so went back to the second grocery to wait some more. This time I started getting worried since I waited quite awhile. He had all the money, so I couldn't even bide my time by buying the milk. Finally I decided to head for the bridge in case he was waiting for me there. On the way I asked Joe at the bike shop if Barry had been by, but he hadn't. I asked Joe to let him know I would wait at the bridge if he did show up. Fortunately, on the Boca del Rio beach road on the way to the bridge, there was Barry riding in the other direction! He had gone to the grocery store, but since he'd taken a wrong turn, he must have arrived there in between my two visits. Then he headed to the bridge. Finally, not finding me there, he'd turned around to head back towards the grocery, and that's where we found each other. This incident definitely taught us a valuable lesson: we need to have a designated meeting point if we do get separated. It would be great to have cell phones with text messaging for times like these, but we'll have to decide if we'll splurge for them or not, since we have to maintain local telephone service for our DSL internet service, so cell phones would be an extra expense, and no utilities are inexpensive here on the island. We ended up heading back up to Grand Caribe after finding each other, so I never did get milk for my cereal tomorrow, but I can manage on cinnamon toast and cream cheese for breakfast for a day. Yum. Here are some photos Barry took of me riding on the way back to Grand Caribe. These were all taken north of the bridge, which is quiet and rural compared to the hustle and bustle of town. As seems to be the pattern, not long after arriving back at Grand Caribe, it started raining, though not too much to keep us from a quick walk down to AkBol for a bite of lunch. Unfortunately we learned from talking with Phillip, one of the servers there, that our favorite waitress from last year, Bernadette, had quit. Still, the food was good (Belizean combo of salbutes, panadas, and pupusa; and a large mango smoothie for Barry), and it was nice to keep dry under their palapa. We forgot to take a photo, though. Must have been hungry! This afternoon the rain got heavier, so we were glad to be inside. Barry snapped a few photos of the dark storm clouds, though it started raining much harder after he took these, and visibility went way down. Update: As I was writing this, we just sliced open the dragon fruit and ate half of it. It was delicious! Tasted very similar to a kiwi, and such great color it's gotta be good for you. 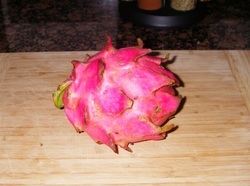 I'm thinking dragon fruit - lime daiquiris would be a special treat once we're in our condo and have a blender. For some reason this unit has every small appliance known to man -- except a blender. Although today wasn't the best of weather, mostly overcast with on and off rain, it kept the temperatures cool, and we still had a fine day. No matter the weather, it's way better than being in the office. :) We woke up bright and early again and got out on a walk to town by 8:15 am. We saw this gorgeous bird we believe is a Hooded Oriole on our way to town. 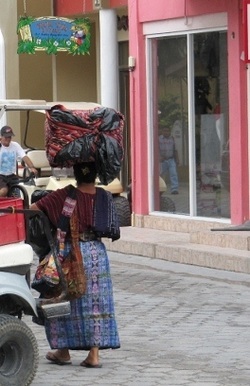 This woman was carrying her wares on her head without using any hands! In town, we went to The Baker, a wonderful German bakery, where we bought a loaf of cinnamon bread, half a huge loaf of slicing whole wheat bread, and an Italian herb focaccia for very reasonable prices ($13.50 BZD or $6.75 US). We then continued on down to south San Pedro, where we saw SAGA Humane Society and found Zac's house. I'd been following his business, Healthy Belize, on Facebook for awhile (https://www.facebook.com/pages/Healthy-Belize/145912062138566) and was thrilled with the possibility of getting some fresh organic veggies and fruit. We had a nice chat with him and bought some organic Malabar spinach and green onions, plus a yummy pineapple. He was a little low on produce today but was to get a new shipment tonight, so we'll certainly be back again soon for more. Our next stop was Joe's Bike Shop, the place where we'd rented bikes on previous visits to San Pedro. Joe has become a good buddy of ours and always gives us a good deal. We rented two bikes for the rest of our trip, as Barry thought his back was feeling good enough to handle riding (and it was!) Our final stop was at a grocery store on the north end of town, Richie's, where we bought a few items for lunch, then made our way back north to Grand Caribe (approx. 1.5 miles north of town). Renting the bikes turned out to be a fortuitous decision as we just beat a tremendous rainstorm back by no more than a couple of minutes. If we'd been walking, we, and our groceries, would have been drenched. Our bread haul - we bought a half loaf of the wheat, but had already had a couple slices for lunch. In condo news, this afternoon we met with Lorena, who works here at Grand Caribe and was such a great help to us in ordering our furniture package. She was super sweet and full of good information. She'd already figured out the one mixed up piece (TV cabinet) we'd ordered and had ordered the correct one two weeks ago, so it is being made now! She's on the ball. We also saw that they were working in our unit today, and the fridge is now installed. They were working on the kitchen backsplash when we went in, and it appeared that the stove would be next to be installed. We ran into the construction supervisor, who said that they need a couple more days, but he thinks we can move into our unit after that! Wonderful news! There will still be a few items on the punch list at that point, but they could be completed either while we are there or after we head back to North Carolina. Barry had begun to think we wouldn't be in at all during this trip, so the news from Rupert was excellent. After waiting out a bit more rain, we saddled up on the bikes again and headed back to town, as we'd run out of cash on our previous trip, so needed to restock our wallets. We hit a couple of grocery stores, then headed back to start making our dinner. Due to all the rain, the road was in terrible shape full of puddles and mud. Yes, it's sandy mud, not our beloved (?) North Carolina red clay, but it was still very messy. We came home splattered in mud, and our bikes look like we did some serious off-roading. I guess technically we did, since the roads north of town are all unpaved. We forgot to take photos, but as this is rainy season, I am sure we'll have another chance, or many! Back at Grand Caribe, we constructed a delicious veggie pizza on the Italian herb focaccia with tomato sauce, fresh tomato slices, Malabar Spinach, green onions, a sprinkling of Italian seasoning, and a six-cheese blend. Here's what the pizza looked like before cooking, and as we were sitting down to eat on the veranda. While I made the pizza, Barry whipped us up a nice fruity rum drink to accompany it. A delicious feast! July 4. Happy 4th of July, friends back in the USA! Last night, we tried a new-to-us restaurant last night called Aji. It's a Spanish/Italian/Caribbean place a short beach walk from Grand Caribe, and even closer to Chico Caribe. We'd read wonderful reviews, and it certainly lived up to them. There's a small bar in a palapa and only six tables, all outside. The atmosphere, service, and food were excellent; a few mosquitoes were the only thing that kept it from being a perfect evening, as it got dark while we were there. While we were eating, the chef came to our table to verify that we were enjoying our dinner, and he told us that he had plucked the conch Barry was eating (in Curried Conch) out of the Caribbean sea just that day, himself. Wow. I had grilled snapper, which came with veggies and a salad. It was nice to have a light and healthy meal after a heavier lunch. What a nice way to cap off our first full day here. Finally, we made it back yesterday to our home away from home. I can hardly believe it's been so long since we were here last (Labor Day 2010). 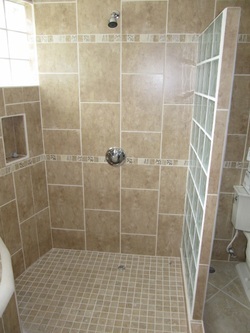 Unfortunately, we are not staying in our Chico Caribe condo just yet, as there are still a few items to finish up. Most everything has been delivered, but the appliance installation has not been done, nor have power or water been turned on. 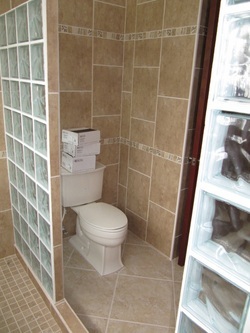 We also have a few items for the punch list, and we haven't done a final closing yet. We are hoping that at least some of this will be complete by the time we leave. The 2-bedroom beachfront unit they put us up in in Grand Caribe is lovely, of course, and better stocked that ours would have been as far as kitchenware, but of course we'd rather be in our own place. Perhaps we will by the end of two weeks. Crossing fingers! Our travel day yesterday was exhausting! Up at 6 am, schlepping huge and heavy suitcases onto the airport shuttle (from long term parking), long lines at the airport, and our flight was delayed for 20 mins. because they had to replace a lightbulb in the hall area that you go through to get on the plane. A sympathetic fellow traveler had to help put our carry-ons into the overhead bin because Barry's back has taken a turn back for the worse after schlepping luggage, and they were too heavy for me to lift overhead. Thank goodness for the kindness of strangers! Our flights were okay, luggage all got here, we didn't get backscatter x-rayed or patted down by TSA, though they did search both of our checked bags (they place a notice inside informing you that they did). Probably because we had lots of sunscreen and other toiletries that may have looked like bombs. Nah, nothing that exciting. We took a taxi up to the Grand Caribe, and ate lunch at the beach bar, Footprints. After settling in a bit we walked into town for some groceries, so even my back is sore today. We also ate dinner at Footprints because we were just too tired and hungry to go elsewhere. Fortunately the food is tasty, and the dress code is extremely casual -- you can even swim up on one side. We were up around 5:15 am today because we're two hours behind eastern daylight time (only one hour during standard time, two during DST), and it gets light early. It was much cooler here yesterday than in North Carolina, with a great breeze. We slept with all the windows and sliders open, and ceiling fan, and had a great breeze. It was a bit cloudy at sunrise time, but still beautiful. It's been a busy day so far. We met up with Bernie and Doris in the morning, and it was great to catch up with them. 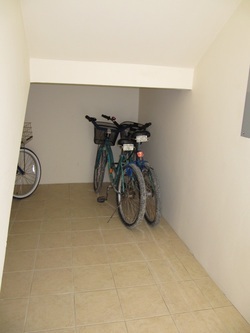 We were able to tour our unit as well as theirs and the other units in Chico Caribe. Bernie has really pulled out all the stops in designing his penthouse unit; and it is a truly luxurious, impressive retreat with amazing views. We also met our new neighbor, Mike from Boston, who has purchased the second one bedroom condo, right next to ours. He happened to be here picking out furniture and such until Thursday. We ran into him again at lunchtime at the Lazy Croc barbeque joint right next door, so we invited him to our table and had a nice chat. After lunch, we all went over to Chico, where we showed him our unit and furniture. He plans to rent his unit out when he's not using it, so this will be a great place for visitors to stay right next door. Barry served as the photographer today while I ran my mouth, so here are some of the many photos he snapped. We just heard the wind howling outside as we worked on our computers, and check out how the sea has kicked up out there. The breeze was almost nonexistent earlier this morning, so this was surprising. The San Pedro Sailing Club is supposed to be having a regatta even as I type this (on small boats), so I am not sure they are able to be out there. It had already been postponed once due to bad weather.